Nice when a trade goes according to plan and this one was soly based on TTT and the oods of getting back to at least the Buy day Low. It could go higher but my goal has been achieved. Now flat. Nice Trade Richbois, don't know much about CAD and FX trading, but obviously Taylor method applies across the board, quite amazing after nearly 60yrs of his original work. 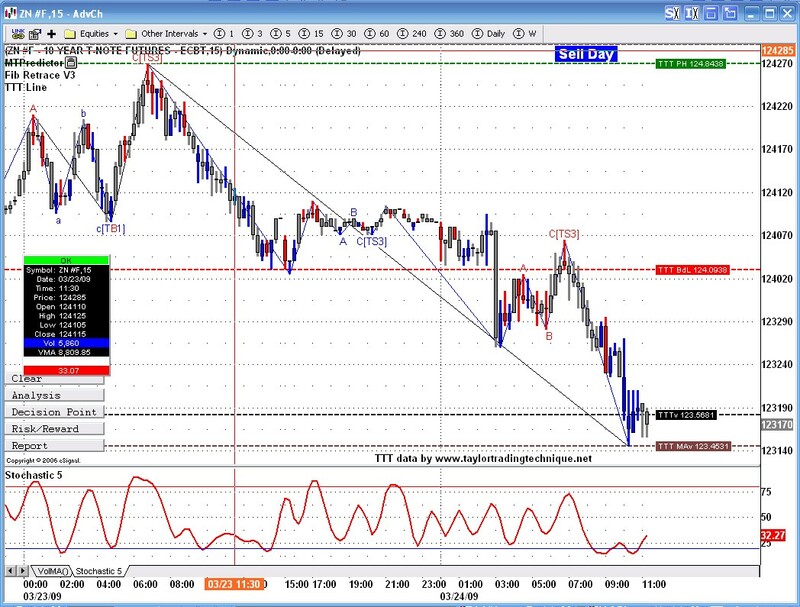 Do you trade any other index besides ESmini, eg. YM, TF or NQmini etc. How did it go today on the ES. 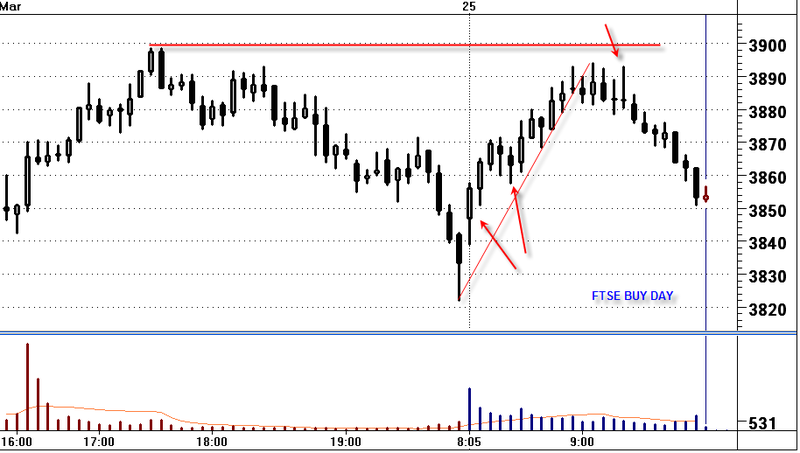 I must say that ES is boring so far today Markets are digesting yesterday's big move. I trade stocks and ES mainly. 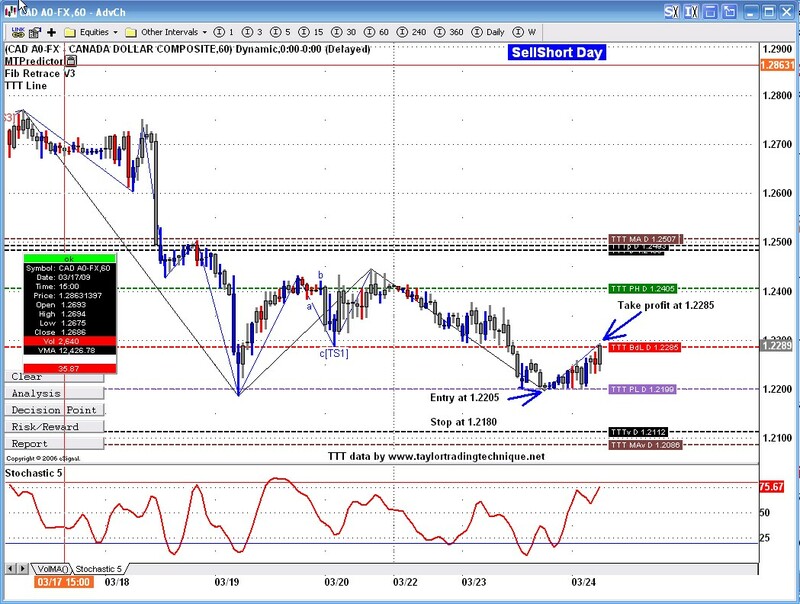 FX is only when I happen to see a trade like this one which is just begging for me to take it. I do provide services on many markets, so that makes me look at other markets but I dont trade them. Living on the West coast, the worst time zone I can think of, dont help either. My next project will be to have an alarm system that would look at all the instruments I service, and give me alerts for any trades that meet my criteria. Hi Rich, could you perhaps post an example of the bonds ? ZN,ZB or the German Bund, whatever you have. Imho, they have a cleaner trends than the indices, if they trend. Thanks in advance ! I really don't know much about bonds But this chart looks like a good play at the moment. 91% odds of getting back to 124.0938 by the end of the day tomorrow. 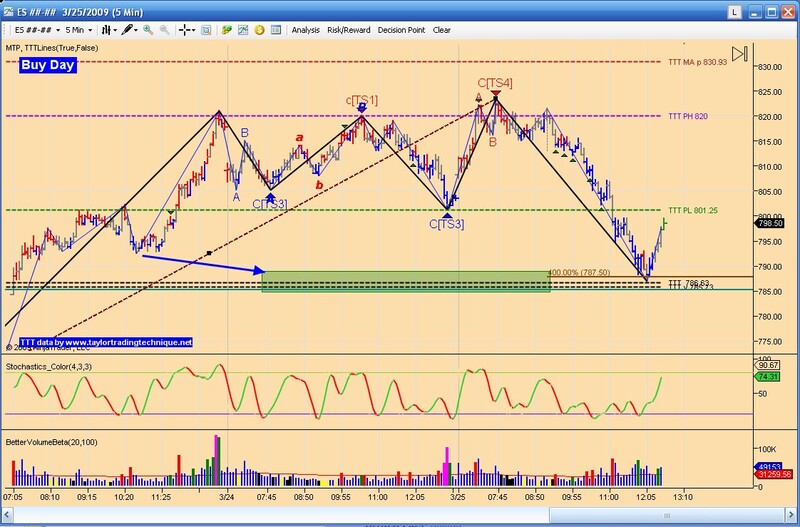 Well ZN didnt take long to get back to the Buy day Low that could have been a nice trade right from the TTT levels too. 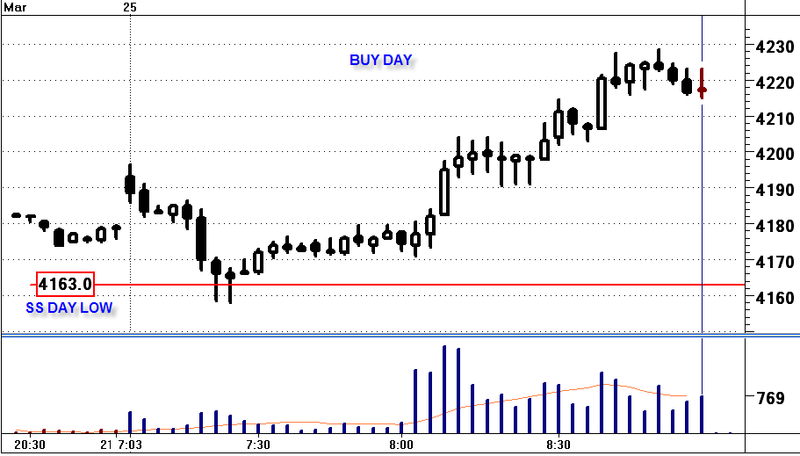 Reverse Scenario playing out today on Buy Day from yesterday. 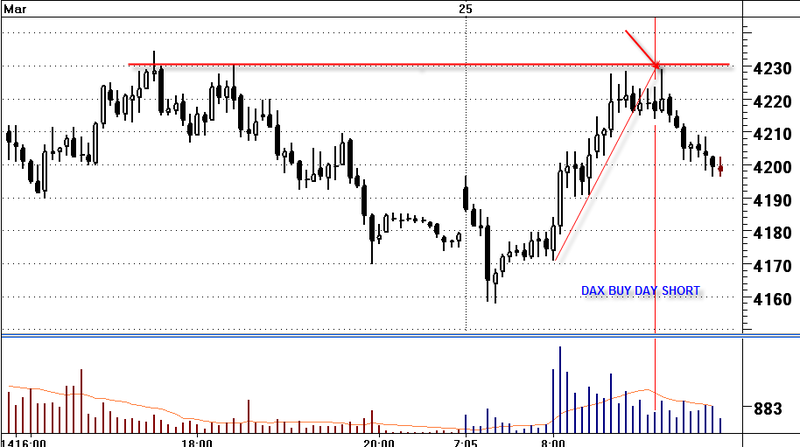 On Dax there was violation of SS day low and then take off. 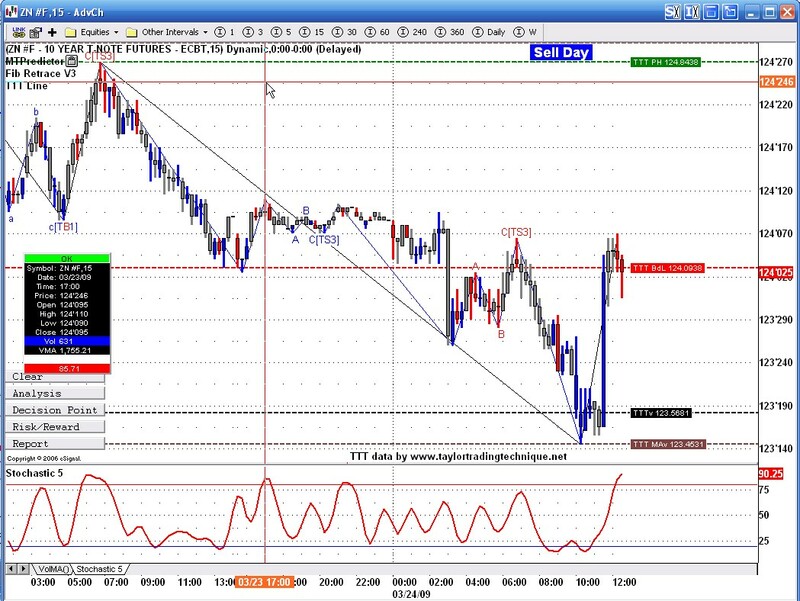 TTT nailed the low on ES today. We had a cluster of support at these levels. 2 TTT levels plus wave C = 400% wave A plus 61.8% retracement from the 761.50 low to the highs and 23.6% retracement from the 662 low to the highs. We were also in the DP zone. I bought at 787.25 and so far 12 points run. I'm having trouble seeing the charts on the forum this morning. The posts just come up with a box saying 'Image Attachment' but I can't open them. Any ideas?